Zooming a long telephoto lens while tracking a flying bird is like simultaneously patting your head and rubbing your tummy—it can be done but requires a lot of practice. 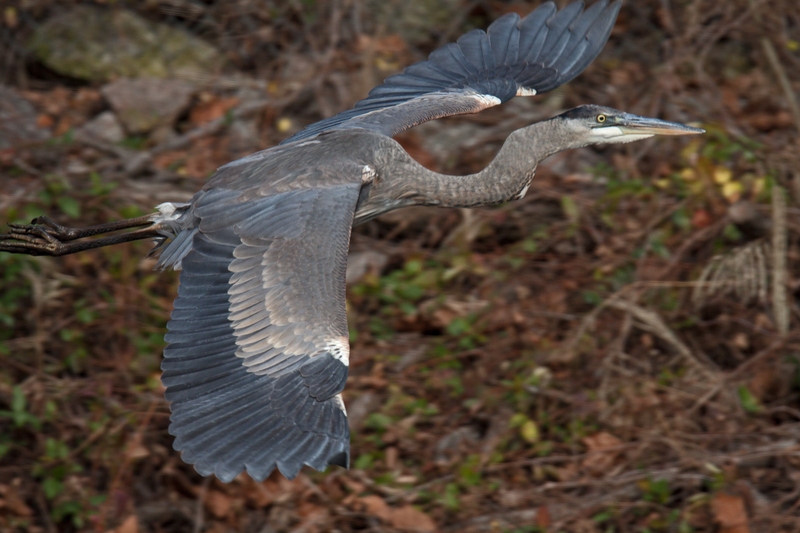 Yesterday as I was observing a Great Blue Heron (Ardea herodias) on the far side of a small pond, he unexpectedly took off. 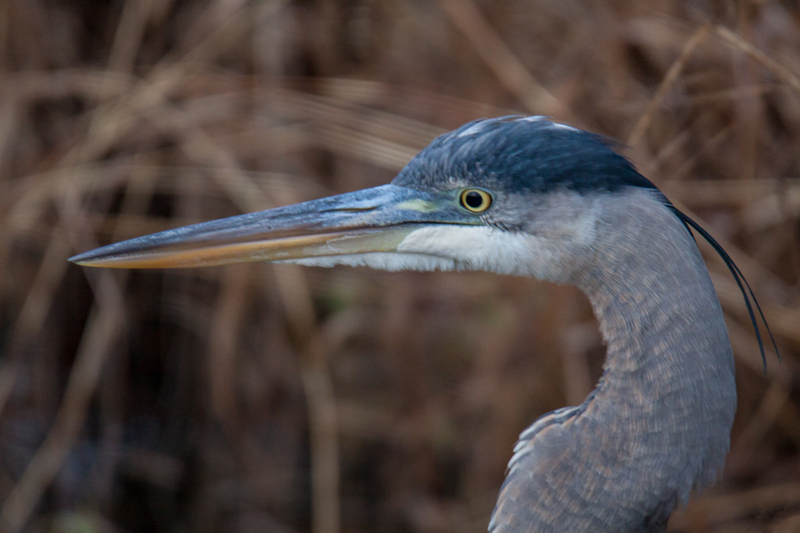 The heron flew towards me initially and then veered off to the side. 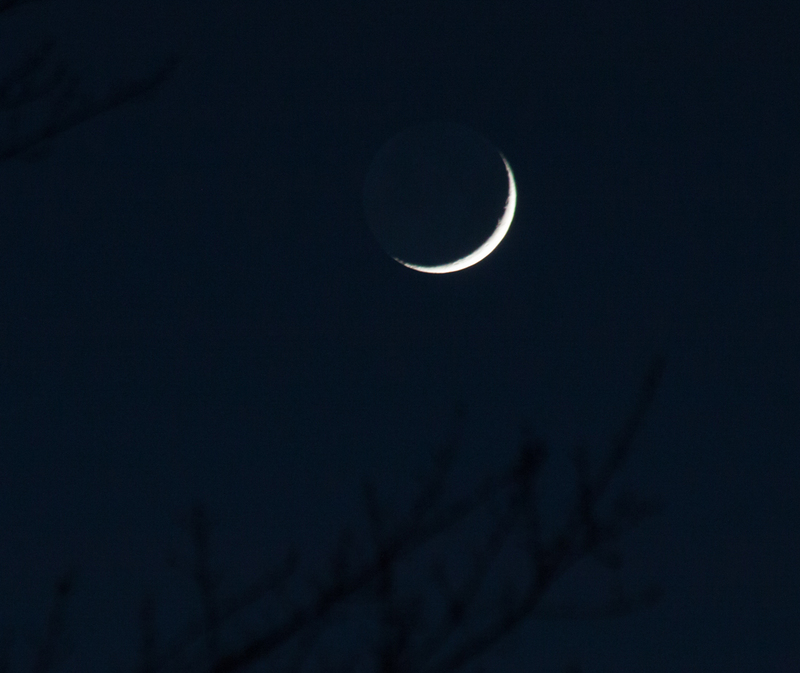 My 150-600mm lens was fully extended at the start and as the bird approached, I frantically tried to zoom out a little. 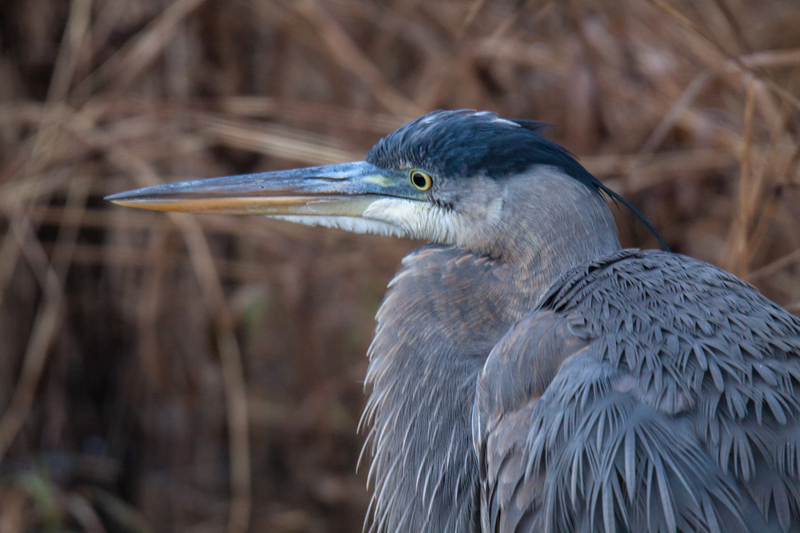 The EXIF data indicate that I was at 552mm when I took this shot and I just barely managed to keep the heron in the frame—I didn’t crop this image at all. I’ve often been told to fill the frame with the main subject and this is one of the few times when I have been able to do so with a bird. 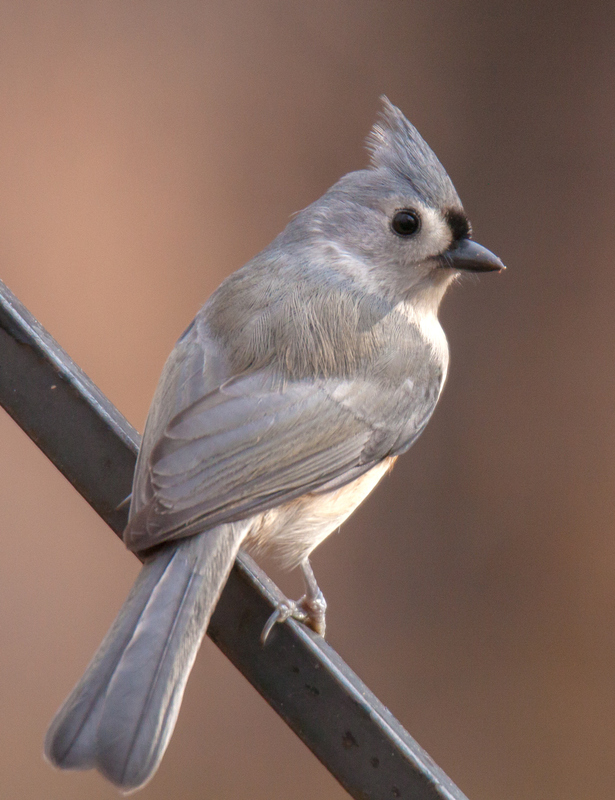 The coloration of the Tufted Titmice is subdued and quiet, but the spiky crest and huge eyes help them to stand out from the crowd. As I was stalking one of these birds, it flew over to a support piece for a bird feeder and perched for a moment, giving me the opportunity to snap off this photograph. Normally I try to have a more natural setting for my bird images, but the bird’s pose was so perfect that I decided to post the image. A simple shot of a common subject can often reveal its beauty—photography doesn’t always have to be complicated. Canada Geese (Branta canadensis) have now invaded the ponds at my local marsh in full force, but the population seems mostly transient, with lots of arrivals and departures, particularly in the early morning hours. 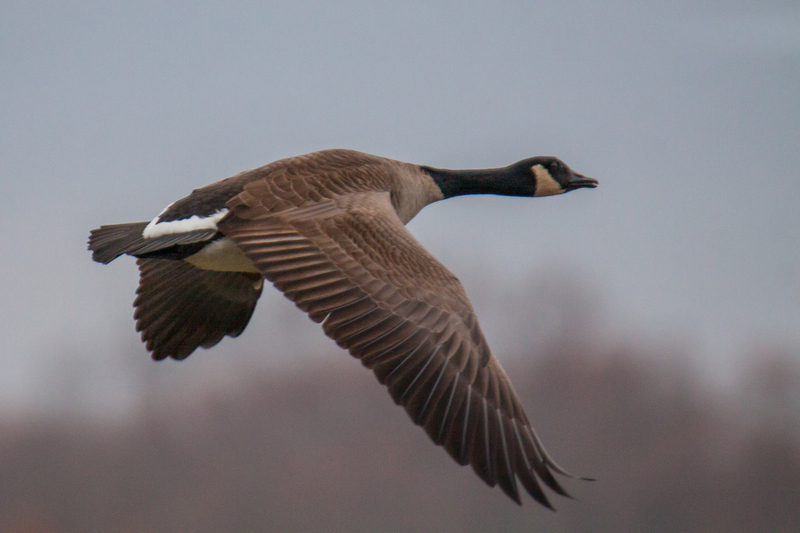 Earlier this weekend, I continued to practice my skills in tracking birds in flight and took a couple of shots that I really like of geese flying in the early morning mist. In both cases I managed to capture a pretty good amount of detail on the goose and the background is a pleasing blur, especially in the first image, in which the hazy outlines of a distant tree line are visible. 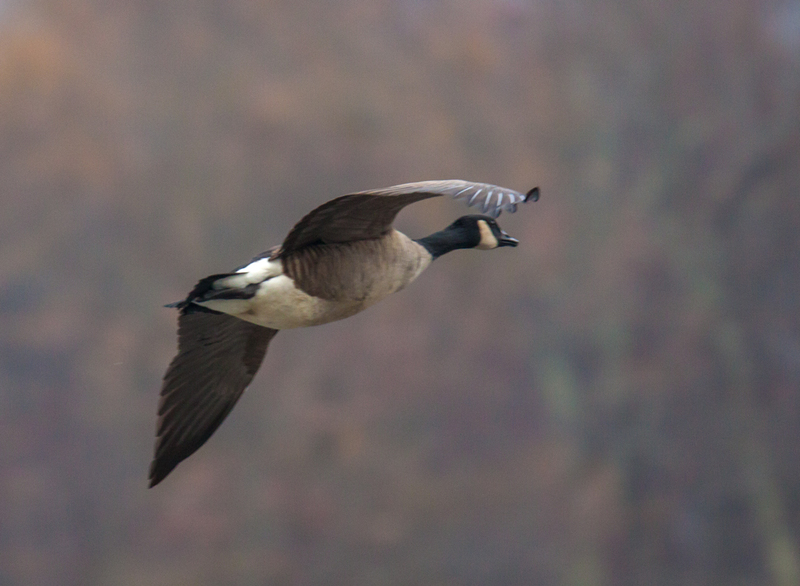 The goose in the second image was making a turn, preparing for an upcoming landing. In the early morning mist yesterday at my local marshland park, the bright red color of this male Northern Cardinal (Cardinalis cardinalis) was even more distinctive than usual, shining like a beacon in the limited light. The white-colored sky and the shadowy shapes of the trees in the distance provide a simple backdrop for this first image that gives it a lot of atmosphere. The wet, lichen-encrusted branch helps to tie the cardinal back to nature and keep this from looking too much like a studio shot, though it does look like the cardinal was posing for me. 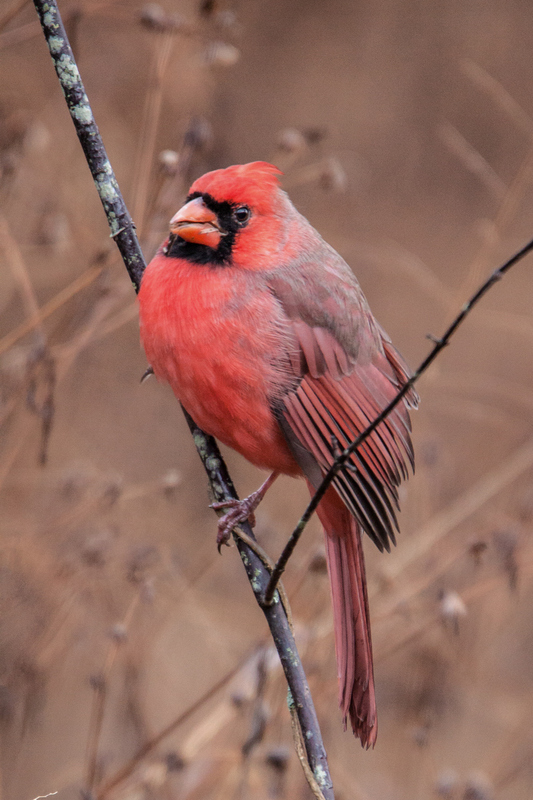 When the cardinal moved to a different perch, the backdrop changed and the white sky was replaced by the dried-out vegetation of a field of cattails. Fortunately, the vegetation was far enough away from the subject that it softened up with the aperture wide open. 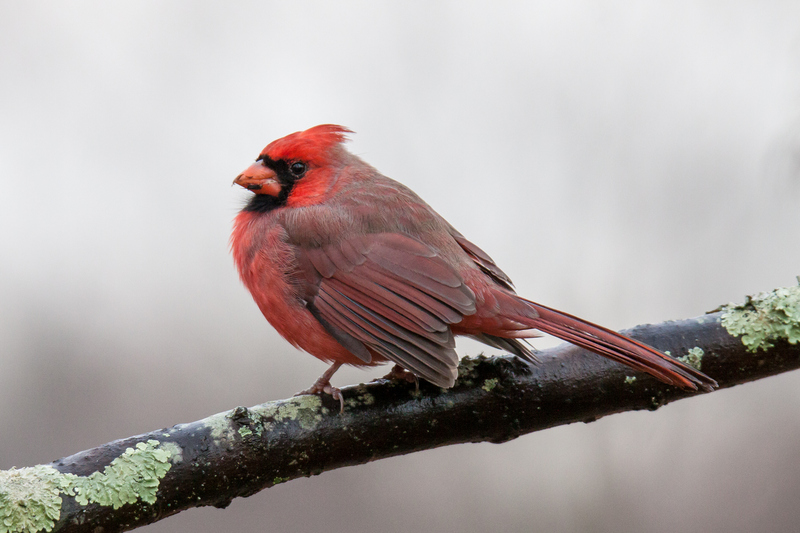 In the second image, the cardinal seems to have become a little irritated with me and is scowling a bit. In both shots, the cardinal looks to have fluffed up its feathers, an indication that it was cold outside when I took these shots. I started my Thanksgiving Day early with a big bird. 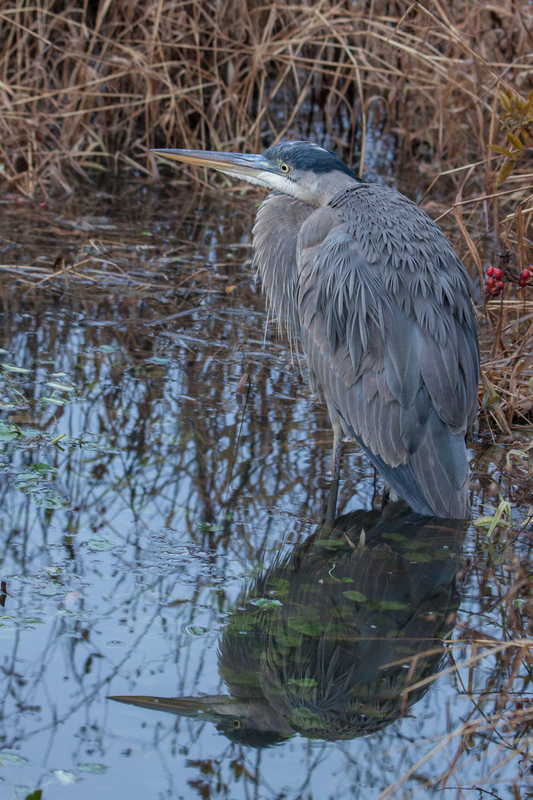 No, I wasn’t preparing a turkey—I was sharing a quiet moment with this Great Blue Heron (Ardea herodias) at Huntley Meadows Park, the local marshland where I capture a lot of my images. One of my goals in testing out my new Tamron 150-600mm lens was to see how well it did in capturing the little birds that hide out in the underbrush. 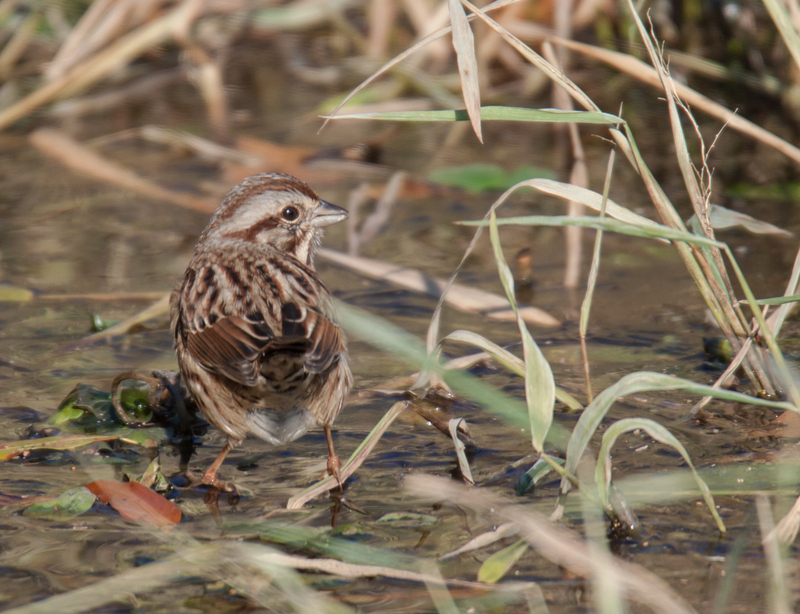 As we move deeper into the autumn and into winter, I can always depend on hearing and sometimes spotting different kinds of sparrow poking about in the tangled plants and leaves in the marsh. These birds tend to be in constant motion, moving quickly from spot to spot after a few pecks, and this weekend I stalked a few of them to see if I could focus quickly and accurately on them. We seem to have had a recent influx of White-throated Sparrows (Zonotrichia albicollis) and I think that all three of the images below are of members of this species. 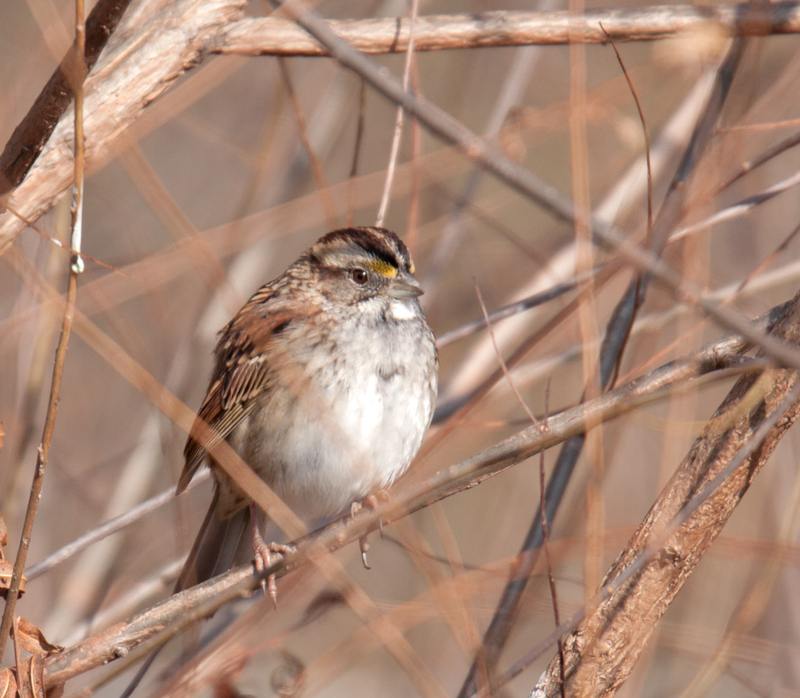 However, sparrows have often confounded me in the past, so I apologize in advance if I have misidentified them. These sparrows seem to have individual personalities and I like the fact that they posed in different ways for me. I used to ignore sparrows and other such birds, but now go out of my way to try to photograph their beauty and individuality. 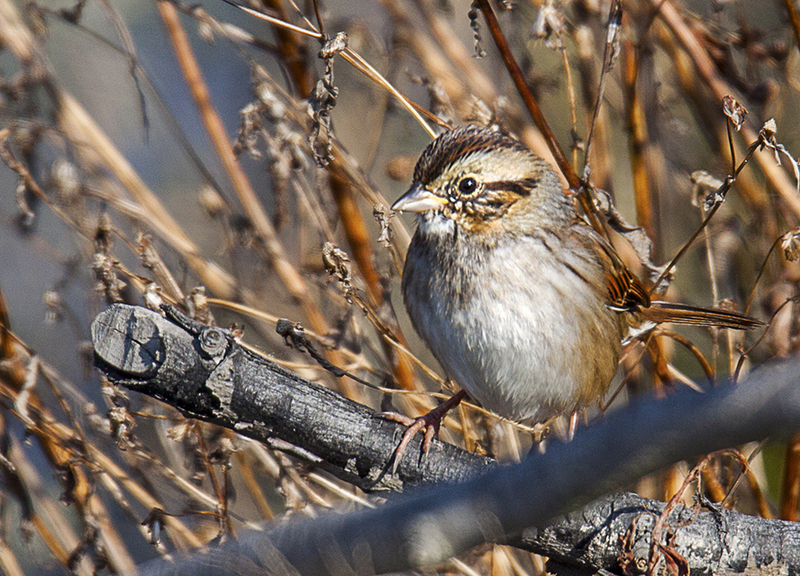 I think my new lens passed the test in being able to capture portraits of these little sparrows. 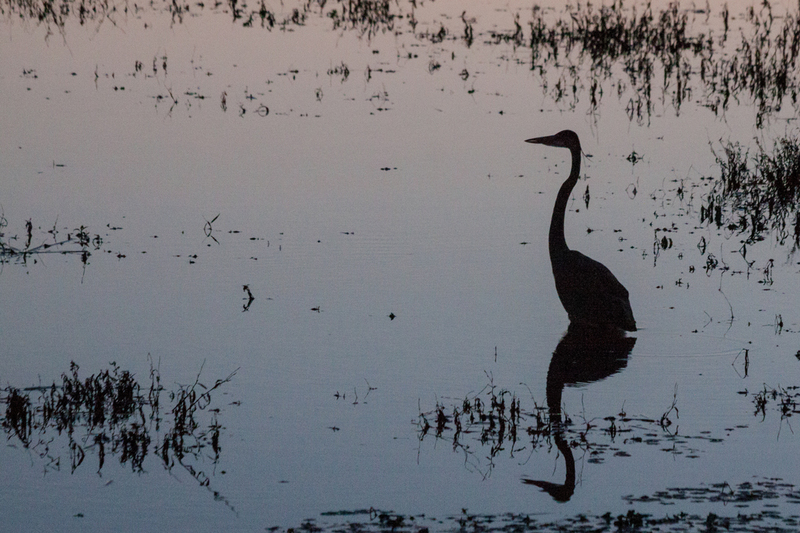 As the sun went down and a sliver of the moon appeared at Huntley Meadows Park, a Great Blue Heron (Ardea herodias) made a last attempt to catch a fish in the dwindling light.